We are convinced that there aren't any good Chinese restaurants in this area. We've tried at least 5 and none have impressed us. I wish we could order from The Lotus, our favorite Chinese spot outside Portland, Maine, but I doubt they'd deliver 400 miles away! My solution to this dilemma? Make it myself, of course! 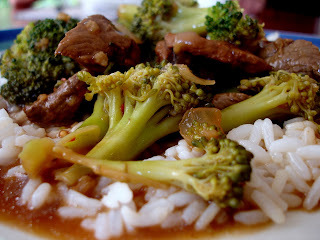 Tonight was Beef with Broccoli over rice. It's so easy and tastes pretty authentic, but without the MSG. I've also made vegetable lo mein, pepper steak over rice, various stir fry dishes, and even homemade dumplings (I need more practice to perfect the dumplings!). - Add broccoli. Cover and let cook about 3-4 minutes. - Add gravy. Cover, lower heat, and let simmer for 10 minutes or so. The sauce will thicken. That meal looks great! Yum.